Services has emerged as the highest contributing sector to the GDP of India, with a contribution of 59% to the GDP during 2011-12. Within services, few of the prime sector include financial services, transportation, communication, hospitality, tourism, community services, etc. Total contribution of Travel and Tourism Industry to GDP of India is expected to grow by 9% from current INR 3,680 billion (4.5% of GDP) in 2011 to INR 8,523 billion (4.9% of GDP) by 2021. So far, urban areas have been the focus of services sector, but for a more equitable economic development, services need to be expanded to the rural areas also. It creates a huge potential for the services sector in the rural areas in the coming future. Service Sector in Gujarat constituted 43 % of the total GSDP during 2010-11. Tourism has seen good growth in the state as international tourist arrivals grew at CAGR of 15% since 2005. In terms of rural services, different areas like rural transportation, retail shops, event management, hospitality , IT and ITeS, tourism, financial services, etc are being explored currently in partnership with various private players as depicted in the adjacent map. The result has been encouraging so far with around 20 districts being covered. There is huge scope for further expansion of rural services given the rapid economic development that the state has witnessed during the recent time. GLPC is involved in promoting livelihood in the cottage industry sector by assisting technical and financial assistance to the beneficiaries through various Central and State level schemes. During the year 2011-12, GLPC facilitated various projects benefitting more than 14,400 SHG members across the state with major focus on areas like retail, event management and catering, tourism, hospitality, financial services, etc. 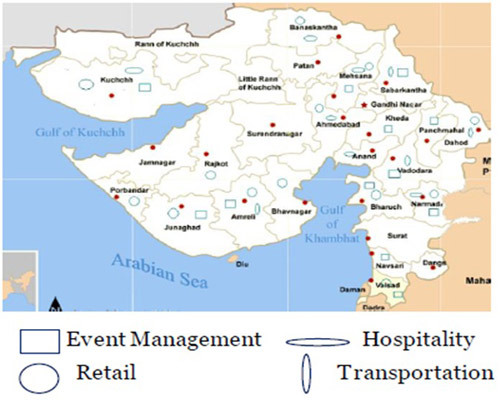 Districts like Mehsana, Dahod and Narmada have been benefitted with many people getting livelihood opportunities in retail and event management. In 2011, GLPC signed a MoU with Tata Motors for the project 'Enhancing Livelihoods through Rural Transportation' for an estimated project cost of INR 150 crores targeting to create livelihood for 25,000 SHG members in next five years by distributing 5,000 customized vehicles in rural areas. Initially the most potential areas will be targeted where customized vehicles will provide services such as Mobile Retail Shops, Mobile Fast Food Centers, Mandap Decoration Van and Sanitation van. One each of mobile catering, retail shop and sanitation van has already been rolled out with SHG members managing them as a pilot project.